Give your guest list a great reason to rise out of bed! 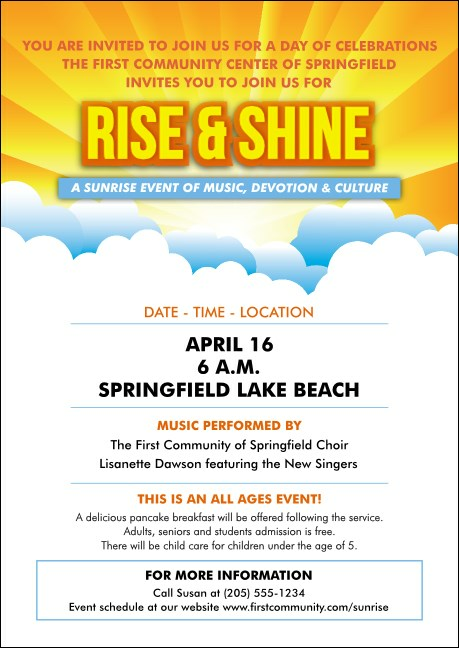 Sunrise Clouds Postcards are the best way to promote morning worship for church groups or any other kind of first light gathering. Each Postcard features a stunning sun rising up from behind large, floating white clouds, and includes the option to customize nineteen lines of unique text on the template. Turn toward the light with TicketPrinting.com.